A smart band that tracks your blood alcohol levels in real time just won $200,000 in a competition sponsored by the US government. The Bactrack Skyn uses a transdermal, electrochemical sensor to track ethanol molecules escaping through your skin via sweat. Then, via a proprietary algorithm, the smart band uses this sensor data to calculate your BAC (Blood Alcohol Content) reading. The results can be synced to a smartphone or smartwatch belonging to the wearer or a family member with the option to get an alert once you go over 0.04% BAC. (The drink driving limit in the US, England & Wales is 0.08% BAC). Now, we said real time but in fact this technology can only give an indication of recent alcohol consumption. That's because ethanol takes about 45 minutes to start being transmitted through your skin. 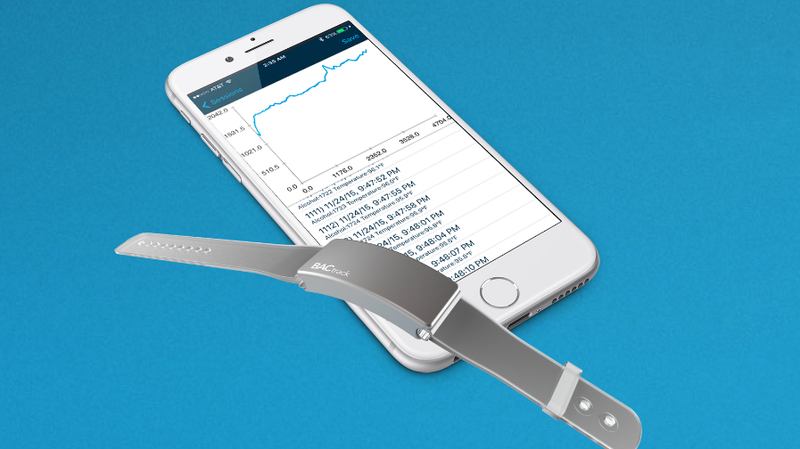 Still, the technology combined with a light, comfortable and inconspicuous design was enough to give Bactrack, a San Francisco-based medical device maker which began selling its Mobile Breathalyzer device in 2013, the win at the National Institutes of Health Wearable Biosensor Challenge. "It can help doctors accurately measure a patient's drinking history, and not just depend on the most recent tests. This can help a lot with the treatment," said Dr. George Koob, head of the NIH's National Institute on Alcohol Abuse and Alcoholism. The smart bands could also be used by police and other law enforcement, when they require a reading of recent historical alcohol consumption, but Bactrack is focusing on the health benefits. The wrist based alcohol monitor hasn't been submitted to the FDA yet and the images are renders. But you can add your email to a wait list for pre-orders now, it will become available in "limited quantities" by the end of 2016.